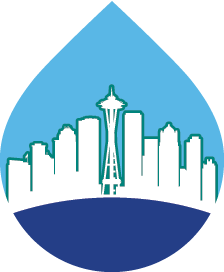 Skyscraper Window Cleaning offers high-rise commercial window cleaning services to all our Seattle clients. Our high-rise commercial window cleaning services extend to shopping malls, insurance companies, banks, universities, business buildings, government facilities, medical device manufacturers, etc. We have many returning clients who appreciate the personal approach we provide along with our quality high-rise commercial windows cleaning. Not only we ensure the windows are spotless and perfectly clean, we also pay a special attention to the frames and windowsills that have to be left without any smears and marks. Our cleaning services include removing the dust from the window corners without any risk for our specialists. After this, using our window cleaning system that works with pure water, your windows will be bright shining presenting the value of your business. Most importantly, the effect will last for a long time. We achieve this supreme quality thanks to the smart technology we used called High Rise window cleaning system that is self-climbing and risk-free. It is a machine that saves a lot of human efforts and provides the desired results all of our clients look after. The system has no drawbacks like leaving marks or scratches on the glass surface and reaches the places that can be hardly reached by a person. 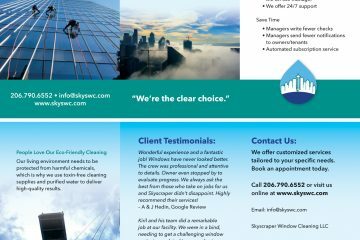 As Skyscraper Window Cleaning is the only window cleaning company in Seattle that possesses and applies such a machine, we get far ahead of our competitors. Using the High Rise window cleaning system guarantees absolutely risk-free high-rise window cleaning, as the machine is operated remotely. Imagine how much efforts and money we save avoiding all industrial ropes, elevated work platforms and human work, which definitely makes our services much more affordable compared to what our competitors can offer. It cleans not only the glass but the frames, too. 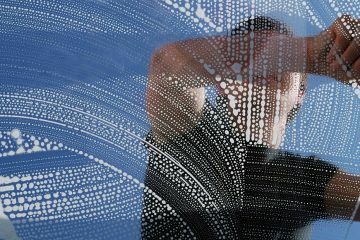 It works with pure water without any added chemicals, so eco-friendly window cleaning is applied. 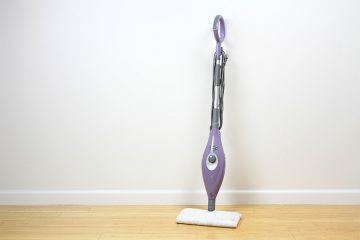 It leaves no marks or scratches in the process of cleaning. We guarantee long-term cleanness with this system, which actually will save you money and time, as the building’s life will be extended. In addition, your prospective clients and eventual business partners will be attracted by the shining look of your business building or offices. The remote control ensures that our technicians will be safe during the high-rise window cleaning process. There are many challenges connected with cleaning high-rise residential windows, but our professional team is experienced enough to find the best solution for each of them. With choosing our services you can be rest assured that your windows will remain safe and well protected and that none of our professionals would be at risk. Applying the latest innovative windows cleaning technologyin this industry allows us to meet all the clients’ expectations and to give a guarantee for top quality.